Considering how well 3D Classics: Kirby's Adventure and Kirby's Dream Land have been performing in the 3DS eShop Charts, it's no surprise Nintendo is bringing more pink-themed games to the 3DS next year. Nintendo's latest release schedule reveals Kirby's Block Ball is coming to the 3DS eShop in early 2012. Originally released on Game Boy in 1995, it's a Breakout-style game with Kirby in the place of the ball. 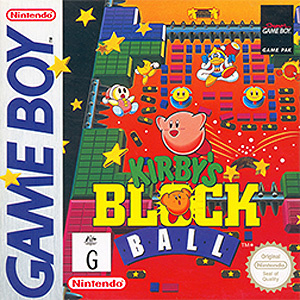 Do you remember playing the Kirby's Block Ball on the original Game Boy? Would you buy it again on Virtual Console? Makes sense. Kirby is nintendo's third pillar and all. Having the little guy my get others to log onto the eshop. I played this game like crazy on the original GB. A very lively and fun Breakout clone that lets Kirby absorb powers. Definitely a good title for the VC. @Shingi_70 Third pillar over Metroid and Pokémon? I've always considered Metroid as the third pillar, but yeah, it is probably Pokemon instead. I used to own Kirby's Block Ball I'll be picking it up again on VC. Kirby's closer to their fifth pillar.... sixth maybe... is pillar even the right word? Kirby is great but do people BUY Nintendo consoles for Kirby? If Nintendo didn't make a Kirby game for five years would people say "where's the next Kirby?" If the Mario series is the first pillar then what is the second? Yay! I loved Block Ball as a kid! This game is alright. Pretty much just Alleyway but with better physics and a Kirbification. Boss fights make a nice touch. Probably still wouldnt buy it myself though. Best blockbreaker game on the Game Boy. I would buy this if all Super Game Boy features were intact. Never heard of this Kirby game. Is it any good? Thats cool, I really like Kirby games so I may have to give this a shot. [email protected] Someone's never played Zelda. I'd say Kirby is more the 5th pillar behind Mario, Zelda, Metroid, and Donkey Kong. @19 It's funny because you implied Donkey Kong was better than Kirby. Pokemon is 3rd piller. it sells handhelds, I know a ton of people who bought their DS's and Gameboys specifically for pokemon, myself included. 4rth is Metroid, Kirby and DK have been on the bench till now, DKCR and the Kirby Wii games are the first real console games they've had since the 64.
but on the topic of Kirby he isn't a console seller but he is a character that those who know him want more of. NOW GIVE ME MORE KIRBY! For a second I thought this was Tilt 'n' Tumble. Color me disappointed. More Kirby is always a good thing, imho! Alot of the newer kids (gamers) haven't played the earlier Kirby titles, which is also why you should release Zelda - Minish Cap and Oracle of Ages/Seasons so a new generation can enjoy them! Just sayin'! I got this game about 5 years ago when gamestop was ending its gameboy game trade-ins and sellings, I have to say- it is one of my favorites and I highly recommend now matter how silly and boring it may look. I actually found one of the last worlds really challenging, very unusual for a Kirby game. I've really only begun to appreciate Kirby for his cuteness, character, background story and the variety in games. (The Wii's Kirby TV channel might have had something to do with this.) I've got a lot to catch up on with the series but i've got fond memories of Kirby's Adventure, Dream Land 2, Star Stacker, Pinball Land, Epic Yarn and the amazing Mass Attack (which deserves even more attention than New Super Bros. imo ). So while i'll still wait for a review i don't think it will make of a difference. This one is as good as bought if it comes to Europe. PS: Never heard about the game before. I love the VC's for continually surprising me with such gems. Sounds pretty cool. Never really have played a whole lot of Kirby I guess. I've played through a few Kirby games, but nothing like I have Mario, Zelda, or I'd say even Metroid. Nothing against them though (if this is really even considered a "normal Kirby game"). @Joshers744: A "normal Kirby game" does not exist. He changes genres like you change your pants- assuming you have lots of pants. Never played this, will pick it up. @battLe ToaD, agreed on MASS ATTACK- one of the Top 10 DS Games of all time, imo.